with him were, his ADC, Lt. Akintunde Akinsehinwa and driver. ‘’Good morning fellow Nigerians, This is Lt. Col. B. Dimka of the Nigerian Army calling. will be met with death. brought to Lagos the following day. he was interrogated by the military Board of Inquiry led by Major Gen.
music records from the NBC library the previous night. members of the young revolutionaries conscripted into the plan. 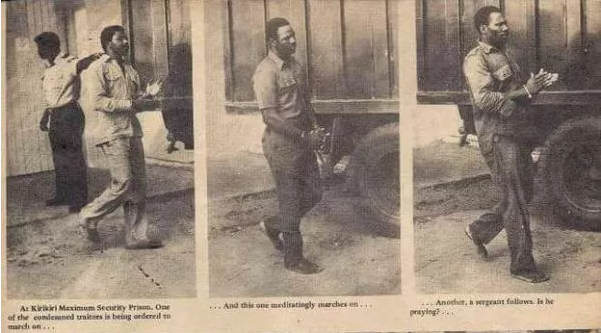 But Gowon, who was in exile at the time denied any prior knowledge of the coup attempt. above except himself in a bid to effect a change of government. In his confessional statement, he said, Gen.
Lawrence Garba was for target three- Lt. Gen. Danjuma. those to be eliminated as the Head of State, the four GOCs, Col.
12, a day before the coup attempt. signal Major Rabo and Lt. William Seri on the approach of the vehicle. So I came up and I was at the petrol station waiting. and the car was held somewhere just opposite the petrol station. revolutionaries had taken over the government. sentences were confirmed by the Supreme Military Council. the then Benue Plateau State, Joseph Gomwalk. justifying mass executions for coup participation. e. Maladministration in general and a host of other malpractice. development in the whole country generally. agree that all the points contained in that article were 100% truth. The sad point about it all is that those who initiated the retirement or dismissal exercise are the worst offenders. You will be informed about the ill-gotten wealth in my next announcement. The acting General Manager of the Nigerian Airways was invited to the Dodan Barracks and detained without trial. The people of this country have been living in a state of fear. The Armed Forces promotion exercise is still fresh in your minds. Whatever reasons they have for the promotion one can only say that they are ambitious. They, in fact, took over power to enrich themselves. We are convinced that some of the programmes announced for a return to civilian rule are made to favour a particular group. To mention only one. Maitama Sule is a politician. But has been appointed Chief of Commissioners for Complaints. This is to prepare him for the next political head at all cost. How many of you know that Maitama Sule is on a salary of N17,000 p.a.? I believe that charity should begin at home. Please stay by your radio for further announcements.